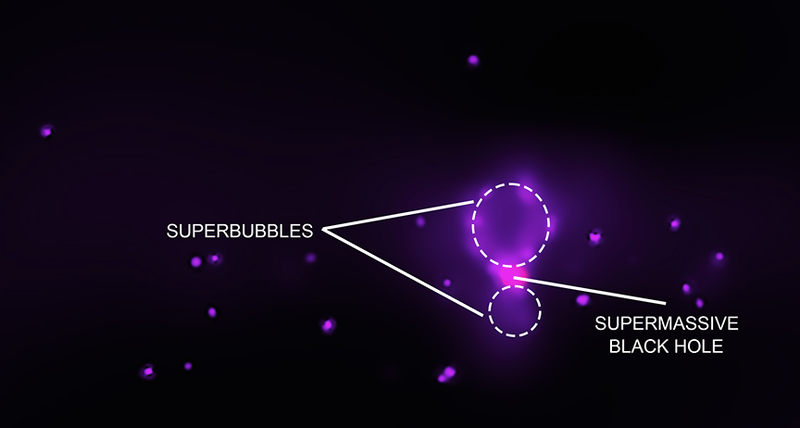 Or, the superbubbles could be from a starburst, a faster-than-usual stellar birth. The bubble-like shape could come from shock waves and compression within the cooler gas. But there’s still an element of mystery here, as the smaller bubble seems to be emanating synchrotron emission, or high-energy x-rays from spiraling electrons, while the larger bubble isn’t. As with lots of the wild-looking things happening in space, these bubbles might be a potential source of the high-energy particles called cosmic rays that strike Earth from outer space. They might even be a source of those cosmic rays whose energies are too high to be accelerated by a single supernova, according to the paper published in The Astrophysical Journal. The energies and locations of the x-rays demonstrate that the particle acceleration occurred at the outer rim of the bubble, rather than at the centre of the galaxy. Four observations dating back to 2001 were needed to capture the x-ray portion of this image with the Chandra X-ray Observatory, totalling nearly 36 hours of observation time. If you were looking at NGC 3079 directly with your human eyes, it wouldn’t look anything like the image at top. The whole exposure combines 35 hours of observation time, and the x-ray frequencies (observed by Chandra) are rendered in purple and pink, while the visible light frequencies (observed by Hubble) are rendered in red and blue. This is typical of how these sorts of space images are processed for the public. Rather than be annoyed at those who created the image for deceiving you, you should be irritated with the forces of evolution for making human eyes too limited to capture the full extent of the amazing things happening in space. This set of observations might capture where the high-energy emissions stem from, but they leave lots of questions unanswered, like why synchrotron emission is emitted from the bottom bubble but not the top. Figuring that out, and gaining further insights into how they form, will be up to future telescope campaigns.